“Passion” is what separates the “ordinary” from something “special”. 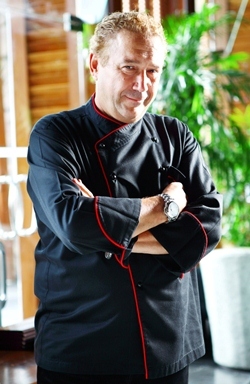 The Centara Grand Mirage Beach Resort Pattaya has an Italian chef who exudes the passion of his homeland. 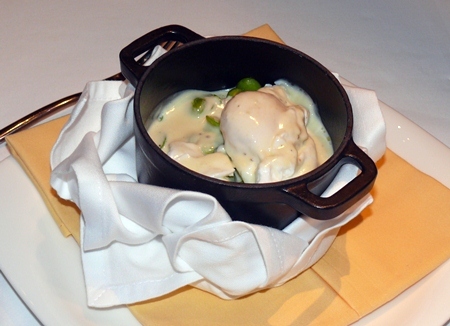 There can be no ordinary meals from Chef Alberto’s kitchen, because Alberto is no ordinary chef. When it was decided that Alberto should host a wine dinner in his Acqua Italian restaurant, he naturally chose an Italian winemaker, as he wanted wines that would also not be “ordinary”. He chose Lungarotti, a vineyard that is synonymous with Torgiano. Founded by Giorgio Lungarotti in the early 60’s, the company now has at its helm sisters Chiara Lungarotti and Teresa Severini. They have the passion to make wine that Alberto can be passionate about too. Everybody in Pattaya must be aware of just where the Centara Grand Mirage Beach Resort is situated, but for the “newbies” this huge property is accessed by going down Soi 18 from the Pattaya-Naklua Road. Go right to the bottom of the soi and turn right and the Centara Grand Mirage Beach Resort is on your left. The entrance is a little hard to spot, but once there you will find plenty of secure parking. Go in the main lobby and Acqua is on your right, complete with welcoming staff. On Wednesday May 15, Chef Alberto is hosting a Lungarotti Wine Dinner, with five courses and six different wines, and at the amazing price of B. 1590++, sounding just too good to be true. So, for the Dining Out team to give you an idea of what this wine dinner is offering, it was necessary for the PR manager Usa Pookpant to arrange with Alberto for us to come for a special preview dinner, two weeks in advance, to get around the printing schedules of a very busy weekly newspaper. The evening began with a small reception around the bar at 7.30 p.m., sipping a very palatable Pinot Grigio while indulging some “Prosciutto al taglio, salami e tante altre cose buone,” which is Parma ham on the bone, salami and condiments. With the palates suitably primed it was time for the Antipasto (8 p.m.) which was (in English) braised broad beans with smoked “pancetta”, poached egg and crutin truffle cheese fondue, served in a black iron crucible. This course will be taken with an Aurente Chardonnay. The second course was a Tuscany soup of cereals and legumes with “bruschetta” and Colonnata’s lard. Chef Alberto described this as “an ugly soup” (to look at), but I found it very enjoyable to eat. The bruschetta very salty, offset by the soup stock and the accompanying Rubesco Rosso di Torgiano wine. The first Main course (Primo in Italian) was a Carnaroli risotto with Porcini mushroom and Addobo Parma ham. This was a very filling dish, and I suggest you begin to pace yourself from here on in, as there is much more food to come. This was taken with the Rubesco Rosso Riserva, Chef Alberto placing much emphasis on the “Riserva” category! The second main course was a grilled Fiorentina steak with a choice of sauces and aromatic salts on potato cake. This steak was served with three sauces, and a choice of four different salt crystals. The smoked salt I found quite amazing! The wine with the steak is a Sagrantino di Montefalco. By this stage I was definitely struggling, and had to pass on the gourmet cheese course. Fortunately Madame had left some space and relished the blue cheese, with honey walnuts and fruit jams. 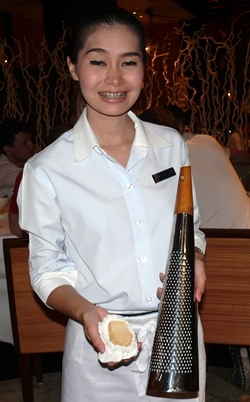 The cheese is taken with a Dulcis Vino Liquoroso. 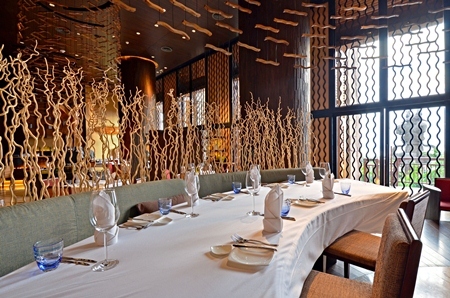 The Lungarotti wine dinner is a most enjoyable way to spend an indulgent evening. Even though the courses were just too much in the end, we thoroughly enjoyed the (pre)event, and we are sure you will too. With the effusive Alberto stage managing everything, you will be entertained, and at the advertised price of B. 1590++, this is fantastic value for money. Make a booking as the numbers are limited by the size of the Acqua restaurant! Acqua Italian Restaurant, Centara Grand Mirage Beach Resort Pattaya, 277 M5, open daily, 6.30 p.m. until 10.30 p.m., telephone 038 301 234, www.centarahotelsresorts .com, secure parking in the resort car parks. Next articleWho is the original source?